If you are new to a plant-based diet or simply trying something new. My advice is to keep trying new recipes. Sometimes one person’s take on a recipe is just not a match to your taste-buds. Make some modifications or try a different recipe. Expand your horizons. If you had told me, even just two short years ago, we would be eating a predominantly plant-based diet, I would not have believed you. It is only because we have been willing to try, to venture outside of our comfort zone – that this has worked. You may just be pleasantly surprised if you give it go. Boil large shells in a large pot with a splash of oil in the water so they don’t stick to the pan. While water is heating and shells are boiling cook your meat or meat substitute. Add a bit of water to keep it moist and season with salt, pepper, paprika, garlic powder, and 1/4 a chopped onion. Add more seasoning to taste. Once your shells are soft drain the water in a strainer and run cold water over the shells until they are cool to touch. Get a glass pan and spread half the Marinara on the bottom. To fill the shells a quick hack is to get an extra large zip block bag and cut off one of the bottom corners. (Don’t make it too small or the ricotta mix won’t come out) put the zip block bag with the cut tip down a large cup. Fold the sides of the bag over the cup. Then spoon the ricotta filling into the bag. Once the bag is full you can use just as you would a “frosting bag” and squeeze the filling into each of the shells. A spoon works well too – just a little messy. Use your “frosting bag” to fill your jumbo shells with the ricotta stuffing until your pan is full. 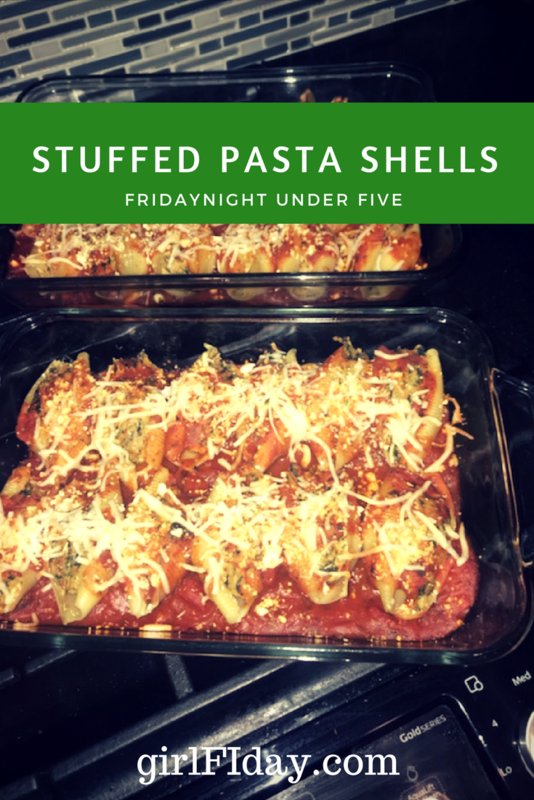 Use the remaining marinara sauce to top the jumbo shells then sprinkle some mozzarella over the whole dish. (Optional: sprinkle with additional parm. or parm. Substitute. Bake for 20 minutes or until heated all the way through. Serve with green veggies and garlic or hot crusty bread.